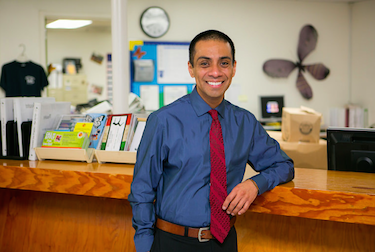 This is the next in a series of profiles on candidates running in the March 3 primary for the LA Unified school board. Today’s focus is Refugio Rodriguez, a candidate for the District 5 seat. “I know, it’s funny right?” Ref Rodriguez says, not really laughing and not waiting for any particular answer to the proposition. He is one of three candidates running for District 5 school board seat in the March election, and he is the supposed charter guy in question. Frankly, it’ll be an uphill battle for Rodriguez, 43, to fight the perception of him as a pro-charter challenger, facing the staunchly anti-charter incumbent, Bennett Kayser. The third candidate is Andrew Thomas, a professor of education at the online Walden University and operator of a research company that consults with school districts, including LA Unified. Over the years, the schools, called Partnerships to Uplift Communities (PUC), have grown to serve about 5,000 students. All got their seed money from the biggest players in education reform — either the Walton Family Foundation or the Bill and Melinda Gates Foundation. He says all but a handful of PUC schools out-perform the surrounding public schools. Further complicating matters in his perception challenges is this month’s endorsement by the California Charter Schools Association, the most powerful and well-funded charter school advocacy group in the state. “Rodriguez will add another sensible voice to the thoughtful coalition of three of four incumbent board members seeking re-election,” CCSA Advocates — the political arm of CCSA — said in a statement. The group has already contributed about $3,200 in independent expenditures to his campaign. Although it’s not a large amount, he says he expects CCSA will ramp up financial support as the race heats up. Overall, he has raised $51,001 through the most recent reporting period, nearly as much much as Kayser, $56,503, according to the City Ethics Commission. Thomas has raised $9,212. Technically, it’s been years since he’s run PUC. He stepped down in 2009 to help launch Partners for Developing Futures, “a social investment fund dedicated to investing in leaders of color to start and grow high performing charter schools.” He’s also an adjunct professor in the School of Education at his alma mater, Loyola Marymount University, where he helped develop a Master’s and Administrative Credential Program for aspiring leaders in Charter Schools. And most recently, he was appointed by Governor Brown to serve on the California Commission for Teacher Credentialing. Rodriguez is critical of the seven-member board for being so polarized. While it’s the type of olive-branch language often invoked by members of both sides of the education debate, it is almost improbable that he’ll get any support from unions. Kayser has already been endorsed by SEIU 99, which represents cafeteria workers, janitors and bus drivers, among other district employees. And he’s a favorite of the teachers union, UTLA, as its strongest and most unwavering ally. Plus, in the view of unions, Rodriguez is tainted by the Walton money he has accepted to launch many of the PUC schools; the Waltons own Wal-Mart, which SEIU has long campaigned against for their anti-union tactics and low hourly wages. And, if board members Tamar Galatzan and Richard Vladovic win their re-election bids as incumbents often do, the presence of Rodriguez on the board (along with pro-reform member Monica Garcia) could shift the political balance, back to a pro-reform majority.